Welcome to Stucco Testing Specialists home. Contact us today to book your punctual and professional EDI Certified stucco inspection. Stucco inspections are performed by EDI certified stucco inspectors. Real estate reports are provided with the results fo the stucco inspection conducted. After thorough certified stucco inspection, we provide recommendations for repair. We are available to inspect any commercial stucco or EIFS application. Moisture testing by certified inspectors on the exterior of the home. For a period of over 10 years, building codes allowed for incorrect installation. Stucco facades can hide serious deterioration of the sheathing and framing. Real estate buyers will require a stucco inspection when home shopping. Why Do I Need a Stucco Inspection? Can I tell if my stucco is failing? Visually it is impossible to see the hidden problems beneath failing stucco applications, although in some instances, if the problem exists for long enough before being addressed, signs start to become evident. Dark staining on the facade, damp interior drywall, mold spots appearing on internal walls can all indicate a serious stucco failure requiring remediation to be carried out. Do I need a Stucco Test? If your home has a Stucco facade and has not had a stucco test carried out in the last 2 years, you should consider getting a stucco test. If you are buying or selling a stucco home, a stucco test is highly recommended to uncover any hidden problems and avoid costly lawsuits. How do you test the stucco? A comprehensive stucco test is carried out by moisture and resistance testing. Pairs of small holes (3/16th of an inch) are drilled into the stucco at specific locations on the house. These inconspicuous holes are small and are filled with a color matching caulk product when completed. A moisture probe is inserted through these holes and into the substrate and framing behind the stucco. Our certified stucco testing specialists use state of the art Extech moisture meters with hammer probes. 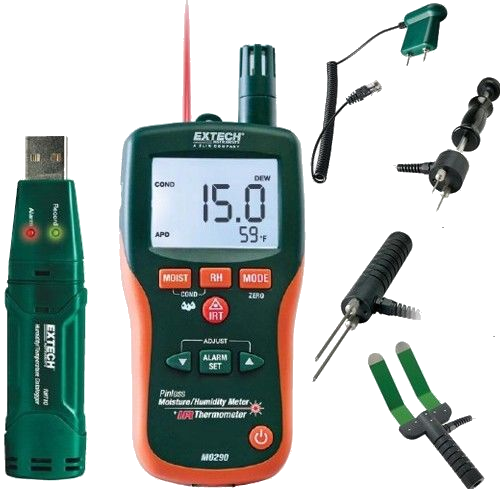 The Extech gives a much more accurate moisture reading than the typical cheaper probes used by many companies. The Extech reads moisture content from 1% to 100% versus a scale of 1-40 on inferior meters.This eliminates any guessing games on just how much moisture the substrate is holding. The moisture content of the substrate indicates the health of the building envelope. A resistance probe determines the integrity of the substrate and the framing behind the stucco. This is accompanied with a visual inspection to determine the existence or lack of building details such as expansion joints, weep screeds, flashings and kickout diverters along with the existence and health of caulk joints and sealants around penetrations. The stucco itself is usually the last thing to show signs of failure. When water enters behind the concrete stucco and gets absorbed into the sheathing and framing, vast amounts of hidden damage can occur, leading to the eventual collapse of the supporting wooden framing. Stucco problems come from the failure of the application and/or inadequate construction materials and techniques, including the lack of an adequate drainage system that allows the stucco to purge itself. Homes built between 1993 and 2006 have a much higher failure rate (estimated as high as 90%) due to incorrect building codes during that timeframe. What will I receive when I book a test? You will receive a comprehensive stucco inspection carried out by an EDI certified inspector. The test will consist of moisture and resistance testing throughout the building envelope along with a complete visual inspection of the entire exterior facade. Upon completion, you will receive a detailed report informing you of the health of your stucco system accompanied by recommendations for areas in need of repair or preventative maintenance. 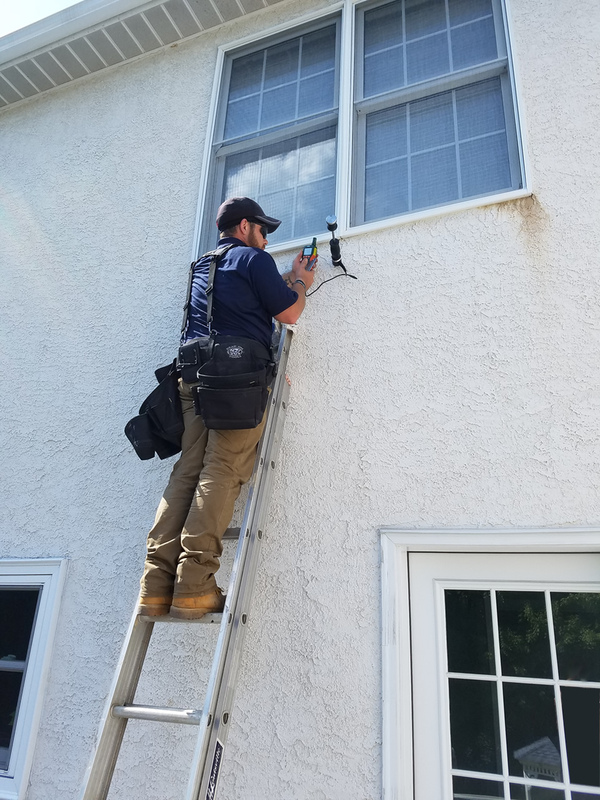 If your home has a Stucco facade and has not had a stucco inspection carried out in the last 2 years, you should consider getting a stucco inspection. If you are buying or selling a stucco home, a stucco test is highly recommended to uncover any hidden problems and avoid costly lawsuits.